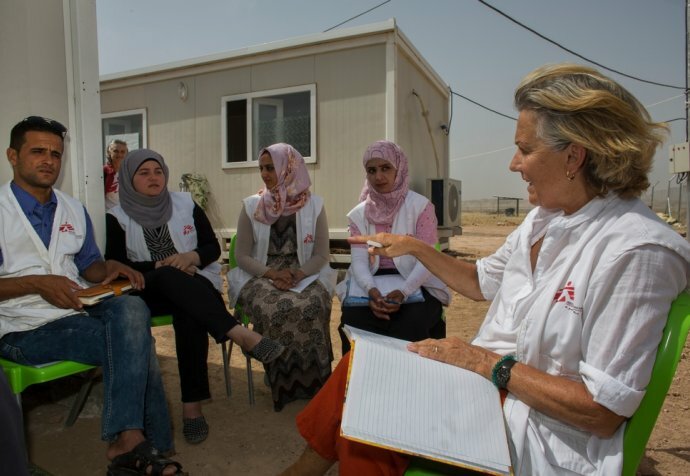 On World Mental Health Day, Mental Health Referent for the Middle East, Dr Gregory Keane describes how Médecins Sans Frontières is innovating to improve mental health care for people in this region. One of the things we’re trying to invest more in is training local general doctors in mental healthcare. In most of the areas we are working in the Middle East, there’s almost no mental health component of general medical training, so doctors don’t have much confidence in managing mental health conditions. The predominant model of managing mental health is very medical, relying almost completely on psychiatrists, with less understanding about what role counsellors and therapists can play. We are aiming to broaden that, and bring more mental health expertise into primary healthcare. Our international psychiatrists train local doctors to identify and manage mental health conditions, and to improve their understanding of when to refer to a counsellor or a psychologist. This means we not only support skill development for local doctors – but also means we have many more trained doctors and nurses who can provide services to our patients. "We modified the buses by taking out all the seats, and installing some curtains for privacy. It’s great idea, because when a refugee camp opens there are literally no structures except tents, plus you want to work in different locations on different days, and the bus allows you to move the clinic around"
One way that we have adapted our care to the context is by providing a mobile mental health clinic on a bus in displaced person’s camps in Iraq. It was an innovative way of doing something quite quickly. We modified the buses by taking out all the seats, and installing some curtains for privacy. It’s great idea, because when a refugee camp opens there are literally no structures except tents, plus you want to work in different locations on different days, and the bus allows you to move the clinic around. But there are limitations. On the bus, we can have three consultations going at once, only separated by curtains, so confidentiality is negatively impacted. That means that people self-screen on whether to come for care. That would have been a problem, except there were so many people who needed help that we were full anyway. We have now moved many of our clinics into demountables, but we still have two buses. We are also trialling the use of internet-based counselling, in association with a German NGO, Ipso. In places like Syria where the context is too volatile to provide face-to-face training, we already use video-based training using systems such as Skype. So, we thought we’d see if we could expand that to ‘therapy by internet’. We’ve started a trial in Atmeh hospital, in Idlib in northern Syria, where MSF runs a burns unit. We are getting really good feedback and outcomes – but it is early days. This system will not only improve access to mental healthcare, but what is really important is moving on from access to outcomes. What are the improvements we can offer in terms of health outcomes for these people? Can we get them functioning better? Can we get them back to work? Can we get people to the point where they can look after their families? That’s the key.